Ready to use, fast acting weed killer for weeds on flower beds, patios, paths and driveways. 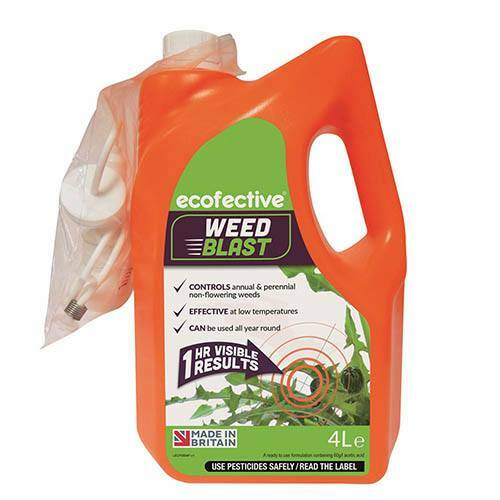 ecofective WeedBlast is an effective, ready to use weed killer which uses acetic acid and a patented formula of natural ingredients to control annual and perennial weeds in gardens, patios, paths and gravel, with visible results after 24 hours*. ecofective WeedBlast is also effective in garden areas in between where vegetables and plants are grown, as no residual is left behind in the ground. The formula dries quickly, leaving the treated area safe to be seeded or planted 24 hours after application – as well as being harmless to children pets and wildlife once dried. The product is not temperature reliant, so it can be used all year round when no frost is present, making it the essential gardening must-have. When weeds are in flower they are easily seen amongst your garden flowers. Resist the urge to spray with WeedBlast during the day when bees and other beneficial pollinators are actively visiting the flowers. Spray either early morning or late evening when the bees have left the area or when the weed is not in flower. Supplied ready mixed in a 4L container with applicator, provides up to 140sq metre coverage. Best results are achieved against moss and small weeds less than 10 cm (4in) high. Use around unplanted areas of the garden, around buildings, on patios, paths and gravel where weed or moss control is required. There are no residual effects of ecofective WeedBlast in the soil. Sowing or planting may be undertaken as soon as the weeds or the moss have died. Keep spray off vegetables, flowers, shrubs and lawns. Spray directly onto the weed, with visible results within 24 hours*. Ideally use in spring and repeat as necessary over the growing season, up to a maximum of 6 applications per year. Apply on a dry, calm day when rain or strong winds are not expected. Apply at no more than 100ml/m2. Use plant protection products safely. Children and pets can enter the treated areas once dry.